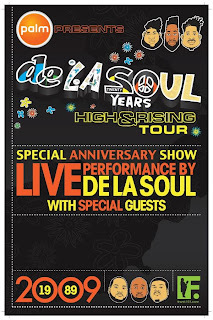 From the year rolls by department... De La Soul @ Emo's tonight, August 1st! De La Soul is an American hip hop group formed in 1987 in Long Island, New York. They are best known for their eclectic sampling, quirky lyrics, and their contributions to the evolution of the jazz rap and alternative hip hop subgenres. The members are Kelvin Mercer (Posdnuos, Mercenary, Plug Wonder Why, Plug One), David Jude Jolicoeur (Trugoy the Dove, Dave, Plug Two) and Vincent Mason (P.A. Pasemaster Mase, Maseo, Plug Three). The three formed the group in high school and caught the attention of producer Paul Huston (Prince Paul) with a demo tape of the song "Plug Tunin'". Prince Paul was also sometimes referred to as Plug Four. The "Plug" names are alleged to come from the numbers that each bandmate's microphone was labeled on the soundboard. Posdnuos was always plugged into plug one, Trugoy was plugged into plug two, and so forth.